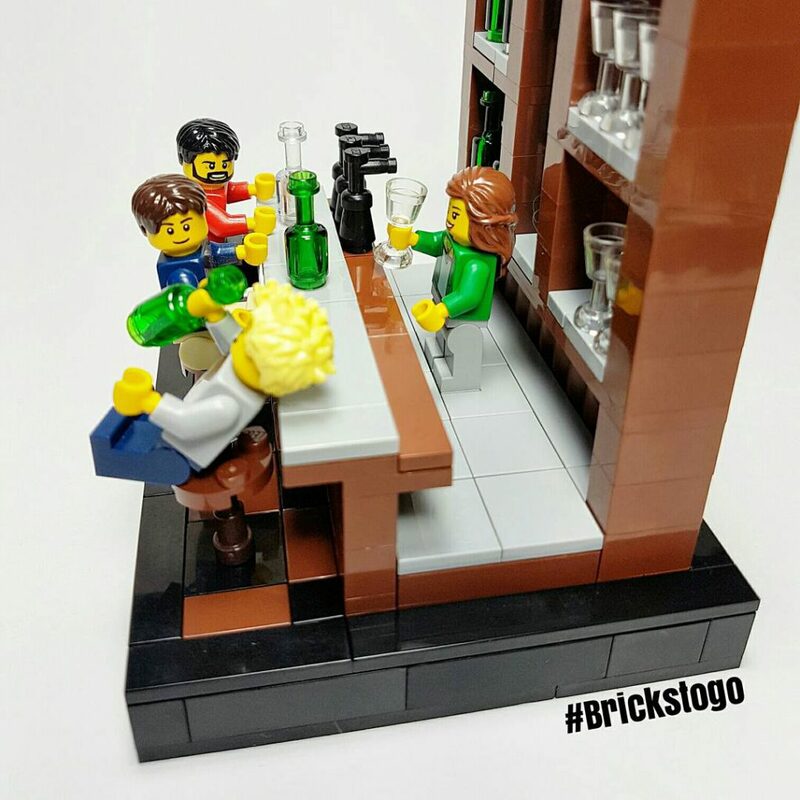 Building a Lego bar seemed like the only appropriate thing to do after ordering a bunch of bottles and wine glasses from Bricklink. 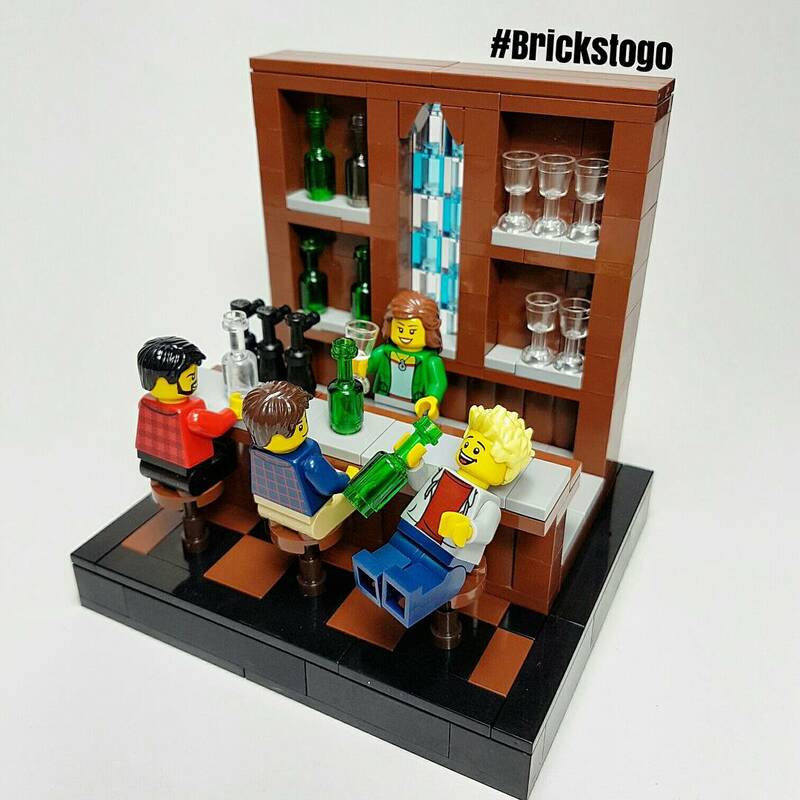 Having not seen too many bar MOCs in the past, I was tempted to try my hand at a small scale bar. But because I’m not a big drinker, I don’t visit bars very often (or at all), so I had to draw my inspiration from movies and TV shows I’ve seen. I wanted to go with an old-fashioned style bar with a wooden counter and shelves, so I started there, building up the counter and bar stools. One of my least favorite parts about starting a build, is that it never looks like anything when you start. I often find myself re-creating the most basic builds over and over again just because it doesn’t look right at the start. The key is just to finish the build, because sure a counter doesn’t look like anything by itself… it’s just a counter! You have to complete the full build, and see the creation in it’s entirety to actually appreciate the little details. My favorite part about this build is the stained glass window in the wall behind the bar. This was a last minute addition after almost everything else was complete. Originally I had placed another row of off-set shelves down the middle, but I felt it looked too boring and brown. So I removed the shelves, and tried out the stained glass look, which I think ties the build together nicely by adding some much needed colour. Lastly I had to add in the bottles and minifigures, which is always the most entertaining part of the build. The final touches are really what brings a build together, and gives the scene some life. I like to try and add in some humor where possible, like the intoxicated gentleman on the right about to fall of his bar stool. I thoroughly enjoyed everything about this MOC, from building it, to creating a scene within it, to taking pictures and sharing them with all of you! If you like the build, and have any comments or questions I’d love to hear from you!